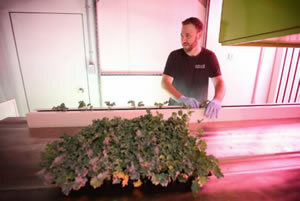 Torstar News Service: Inside an inconspicuous white container tucked in the corner of parking lot behind a Toronto east-end catering company, infrared lights and a vertical hydroponics system will soon produce up to 150 pounds of kale a week. Once harvested, that kale will be carried across the alley to The Food Dudes’ bustling kitchen and transformed into something delicious. “They can start guaranteeing their customers that any kale on the menu was not only grown locally but was literally harvested less than half an hour before people are eating it, which is pretty amazing,” said Aaron Spiro, the president of Modular Farms. Over the last four years the Brampton, Ont.-based company has developed an indoor farming system housed in 40-foot containers made of insulated composite steel panels that they say can grow food in any climate.